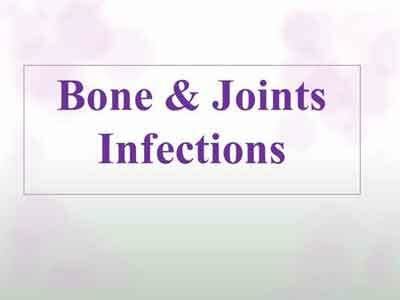 The common infection of bones and joints are mainly due to pyogenic organisms. It usually occurs in small children in the metaphysical regions of long bones, usually to a focus of infection elsewhere in the body through hematogenous/ lymphatic. The offending organisms are staphylococcus commonly: other organisms are less common like streptococcus, Ecoli etc. The bacteria get lodged in the metaphysis where they continue to grow, block small vessels which causes necrosis of bone. Pus focus rapidly which may transverse laterally under the periostenum, form an abscess or may even burst on the surface. This is the tone when treatment should be started aggressively lest it should get converted into chronic osteomyelitus. Osteomyelitus is an acute or chronic inflammatory process. Within bone, bone marrow and surrounding soft tissue that develops. Secondary to infection with bacterial organisms (and rarely fungi). v) Optimal diagnoster criteria, investigation, treatment and Referral criteria. Situation 1:- At secondary hospital/Non-Metro situation: limited technology and resources. Complete hemogram, culture and sensitivity of aspirated material, ZN staining, Gram’s staining. Out patient – if abscess is present regardless of the stage of disease effective drainage is to be done. Situation 2:- Super specialty facility in metro location where higher end technology is available. b. Investigations:- Complete hemogram, Blood Culture, culture and sensitivity of aspirated material, ZN staining, Gram’s staining. The diagnosis and treatment is to be started as early as possible. Delaying the treatment can only increase the severity of the disease. Sometimes patient need to be referred. The patient need to be hospitalized in the early stages of the disease to avoid chronicity of the disease for proper patient care.